Those are the sweet, sweet sounds I have been hearing every morning outside our bedroom window. I think they are hungry, it’s been a long winter. 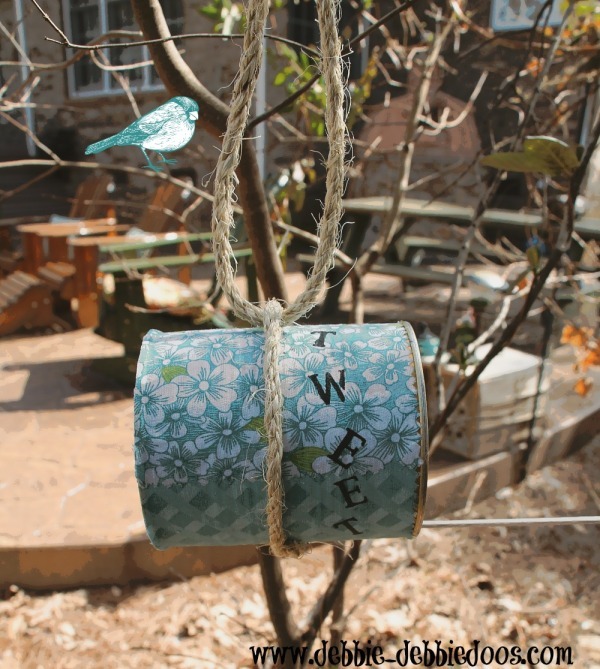 So I decided, I would show you how to make your own bird feeder like I just did, so you too can make your birds happy! This was a cute surprise. 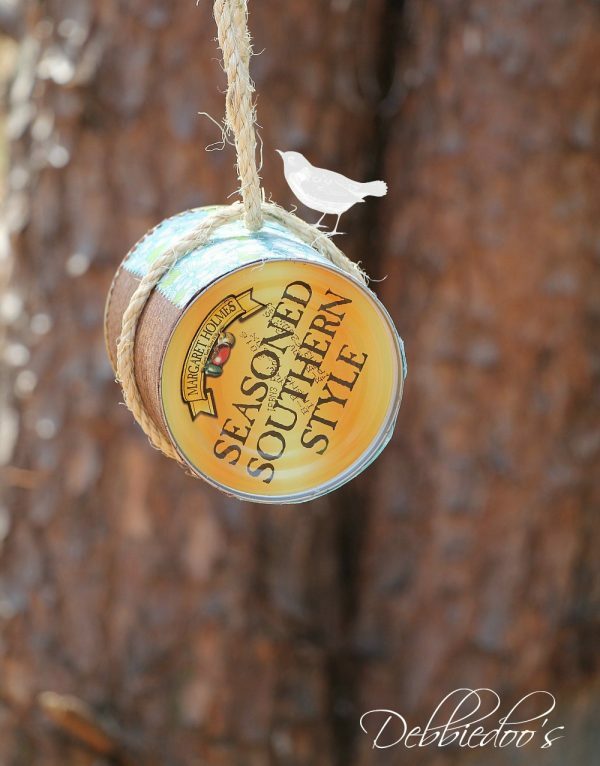 I didn’t realize the bottom of the can said Seasoned Southern style. How fitting for a bird and for living in the South! I have a bunch of the fabric swatches left over from the Baby shower banner I made last year. I found a pack of them at Walmart for just a few bucks. adhere the swatch, it just so happend to be the perfect size, with just a tad of trimming to be done on the bottom. 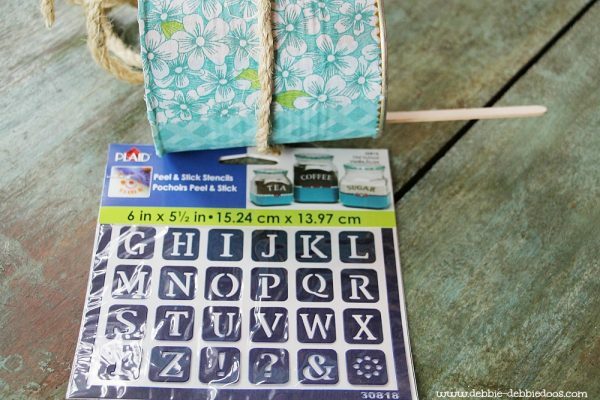 These individual stencils are so user friendly, just peel, stick and paint with craft paint of choice. 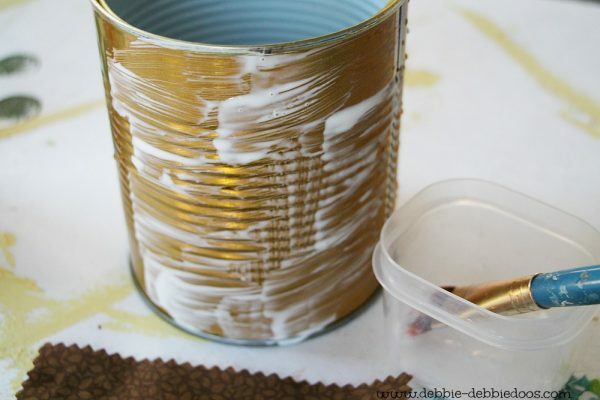 I then lightly sprayed the can with polyurethane seeing it will be outside. Super cute and makes for a happy bird. 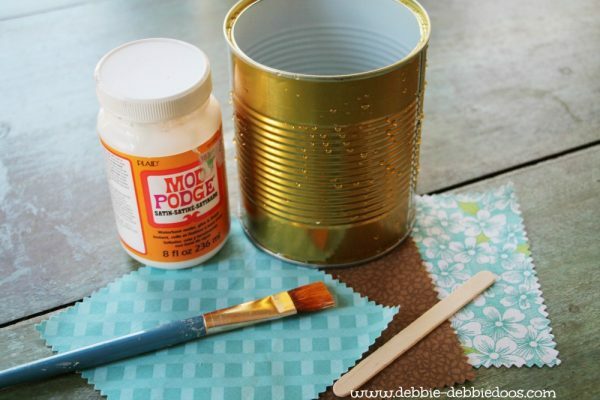 I love can crafts and you can check out my gallery of recycled cans and bottles. I have done quite a few! Cute Debbie, and I love how you have already attracted a graphic bird. You are so funny! That is so cute and I love the bottom. Thought you had chosen that one on purpose. Love this! Wish we had a few birds around here…none yet! Very Cute Debbie. 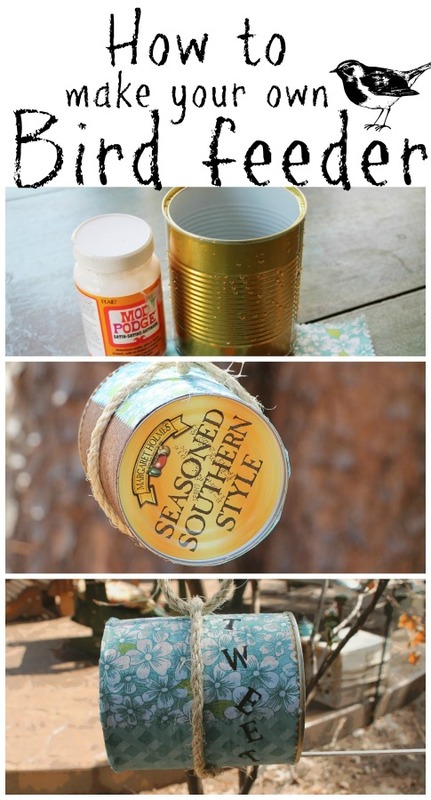 I love that you recycled the can into something new. Great idea and the birdies will love this. I love feeding the birds too. Cute idea! I love feeding the birds! 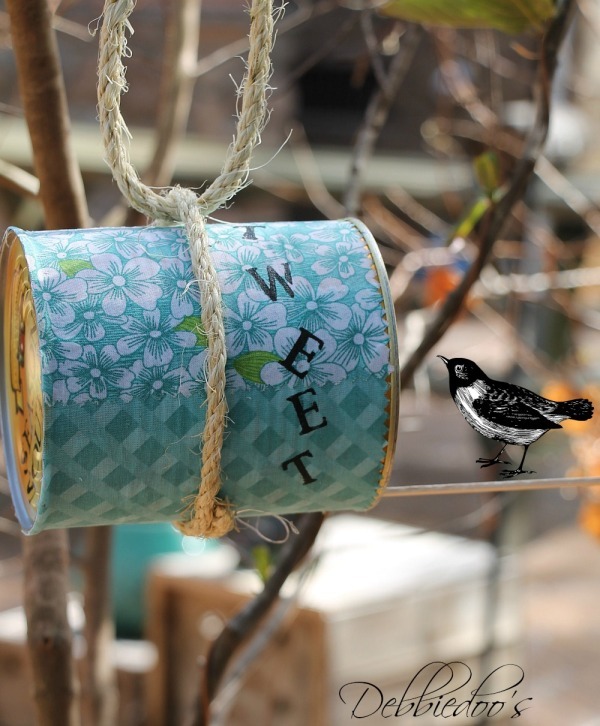 This is a cute way to serve up yummy birdseed for our feathered friends. This is so cute though. Love the paper pattern!! I bet the little birdies will love it!! 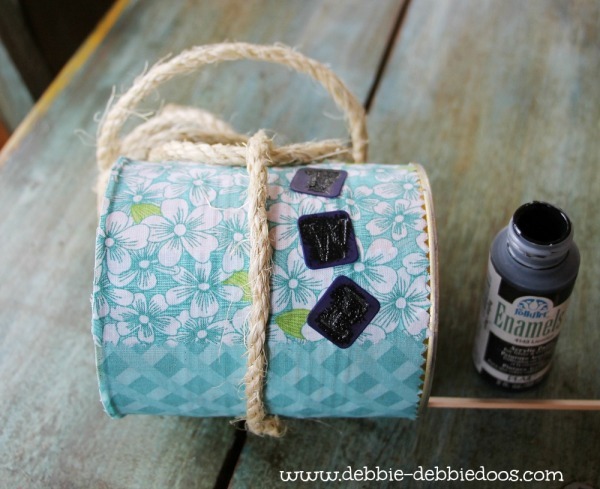 Too cute for words – love the popsicle stick holder ! Keep meaning to – and end up painting a dresser instead – HAVE to start sometime! What a really good idea. My little man will enjoy making one of these. I love that you are recycling and feeding the birdies!! I’ve been hearing more birds lately too..I hope that means spring will be here soon. appropriate size and wala I Love it !!! Yeah, I was totally surprised with how these bird feeders look. I am amazed how these were made. I hope to make my own version of bird feeder too. Thanks for sharing!